Hi fellow DIYers!!! The rain has stopped but I’m not feeling the yard work thing today. Maybe I will a little later but for now,I have a project to share with you. 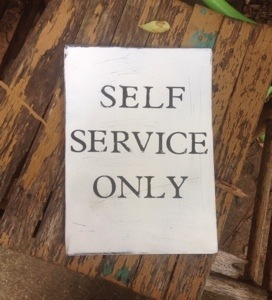 I saw this metal sign from Gina on the Shabby Creek Cottage blog and knew I had to have one. Isn’t it the cutest? I set off to make my own yesterday. I started by spray painting an old metal sign I had black, cut out the words with my Cricut and stuck them to the sign. I was finished!! I really liked this look, but Gina attached the letters, then painted over them in white and then took the letters off. You can read about it on her blog here. The more I looked at hers, then mine, then hers again, lol, I decided I wanted mine to look more like hers. So I took my sign back outside and got out the white spray paint. I sprayed painted over the while thing In white and when it dried I removed the letters. This is what I got.. I didn’t press the letters down hard enough so some of the white paint seeped under the letters when I painted the sign. Did I mess up? 😞 The sign has a worn, shabby look. I was a little disappointed but when life makes you lemons…. 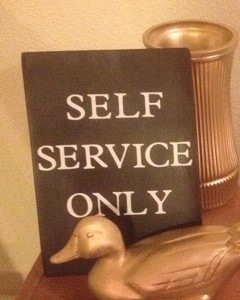 I got out my sanding block and went to work distressing the edges and the face of the sign. Ok, this is my dilemma, should I paint the sign black again and just start over? Or run with what I have? Please let me know your thoughts in the comments. 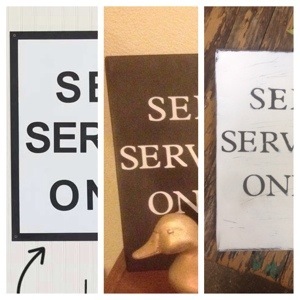 Here’s a side by side by side ( lol ) pictures of Gina’s sign and mine, before and after. To be truthful I like Gina’s the best but mines not too bad.